The Harley-Davidson FLHTC is a motorcycle produced by Harley-Davidson from 1996 to 2005. 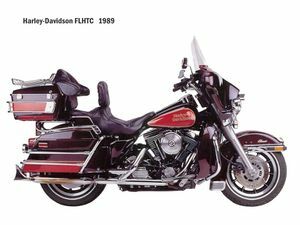 The Harley-Davidson FLHT was introduced in 1983. This was an Electra Glide based on the FLT Tour Glide frame, but using the Electra Glide "batwing" fairing instead of the Tour Glide frame-mounted fairing. Except for the base FLH, all 1984 FLs were equipped with the new rubber-mounted Evolution engine and a five-speed transmission.